Ottawa opened to scoring with a power play goal just to have Johan Franzen score two goals within 48 seconds, by the end of the first it was 3-2 with the Senators leading the Wings. Kris Draper scored to tie it at 3 only to have Niklas Kronwall score 13 seconds later. Senators immediately pulled Robin Lehner from goal just to have Milian Michalek tie it at 4. Johan Franzen opened the third with his third of the night – marking his first regular season hat trick (has three in the post season). For the first time since Sergei Fedorov in 1996 against the Washington Capitals a Red Wing had a 5 goal night. Still without Sidney Crosby and Evgeni Malkin the Penguins are making the best of their time treading water until their super stars return. Do not underestimate the rest of the team as they are still making waives with a shutout over the Islanders and a Goalie Fight! In a battle for the Eastern Conference playoff spot the Canadiens moved ahead of Original Six rival the New York Rangers with their win over the Panthers. Before the new year the Canadiens were 3-12-0 when they let in the first goal and 0-11-0 if they were trailing after the first period; since the start of the new year they have changed that 7-2-2 when they do not score first and to 4-1-1 if they enter the second period behind. It helps that rookie P.K . Subban is stepping up on the offensive side for the defense; having two assist last night and five shots on goal helps take pressure off of some of the veteran players. There might be a slight All-Star hangover in the desert; but the Canucks are on a roll after returning from the short break. Roberto Luongo took the first star honors after notching his 54th career shutout; while Ryan Kesler scored his 29th and 30th goals of the season. The surging Canucks also saw Cody Hodgson score his first NHL goal getting past the collapsing Coyotes defense (Andrew Ebbett and Sami Lepisto) and Ilya Bryzgalov to earn himself the 3rd star of the game. It looked like it could have been a good night for the Oilers as rookie Magnus Paajarvi was the first to get on the scoreboard for the night; however, it would be the only time the Oilers made it. The slumping Kings got a boost from former Oiler Ryan Smyth as he scored two power-play goals; while defenseman Jack Johnson rounded out the Kings scoring in the third. The Ducks are Fowling things up as rookie defenceman Cam Fowler took top star honors in a lost to the Sharks. The Sharks took an early lead – 14 seconds to be exact from Dany Heartly. The Sharks were up 3-0 after 20 minutes of play only to see Joffrey Lupul score early in the second the Ducks surge nearly tie it up in the third. In all things weird and bizarre with the hockey world we now have Fleury Flakes. 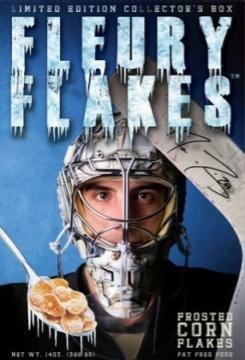 The Pittsburgh area breakfast cereal featuring – you guessed it Marc-Andre Fleury. Pittsburgh Penguins Jordan Staal will not be suspended further for sucker punch to New York Rangers Brandon Prust. In other Rangers news – Ruslan Fedotenko is out for another 3-4 weeks post appendectomy. On the injury front Red Wings Mike Modano stated that he ruptured three tendons and cut a nerve back in November when Columbus Blue Jackets RJ Umberger sliced his wrist with his skate in a collision. Some scary news out of Dallas this morning as Stars forward Travis Morin passed out at the airport and will not play in Boston. Tampa Bay Lightning placed goaltender Mike Smith on waiver; then announced a http://lightning.nhl.com/club/news.htm?id=551400 $35 million Renovation project to the St. Pete Times Forum. As hockey fans there are always the debates between Canadian Teams vs. Sunbelt Teams or the Original Six vs. the Expansion Teams; but Dirk Hoag over at On the Forecheck asks Do the NHL’s Original Six franchises receive special treatment?